North Korean production of at least one Hwasong-15 ICBM has been detected by U.S. intelligence agencies. The Sanum-dong site is associated with North Korea’s ICBM program. The Hwasong-15 is North Korea’s longest-range ballistic missile, capable of carrying a large payload to likely all of the contiguous United States. In Singapore, Kim Jong Un committed to work “towards the complete denuclearization of the Korean Peninsula” in a signed joint statement with Trump, but there are signs that North Korea does not interpret that phrase to entail its unilateral disarmament. Fissile material refers to either uranium highly enriched in the uranium-235 isotope or plutonium-239, both of which are suitable for use in nuclear weapons. The Diplomat earlier this month had exclusively revealed North Korea’s covert uranium enrichment site of Kangson, also on the outskirts of Pyongyang. Together, Pompeo’s testimony and the new assessment confirm that North Korea continues to not only produce ballistic missiles capable of threatening the United States, but also fissile material to create new warheads to sit atop those missiles. Both are in line with Kim’s directive during his 2018 New Year’s Day address for the country’s missile engineers and nuclear scientists to mass produce warheads and missiles. “The nuclear weapons research sector and the rocket industry should mass-produce nuclear warheads and ballistic missiles, the power and reliability of which have already been proved to the full, to give a spur to the efforts for deploying them for action,” Kim had said. 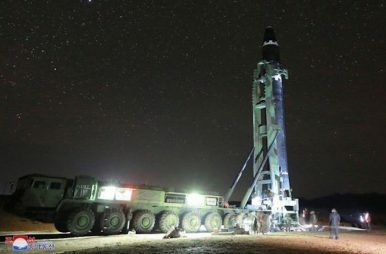 The finding that North Korea continues to produce missiles contrasts additionally with North Korea’s recent moves at the Sohae Satellite Launching Center, where dismantlement activity associated with a missile engine test stand and a staging building for satellite launches has been detected by both U.S. intelligence agencies and open source analysts. The continuance of ICBM production suggests that while North Korea is undertaking activities to demonstrate to the United States that it is limiting its testing program—both for its nuclear weapons and liquid-fuel ballistic missile engines—it is not ceasing production of either ballistic missiles or nuclear warheads.